Charles Walton was a native of the small village of Lower Quinton in Warwickshire, England. He was found murdered on the valentines night, 14 February 1945 in somewhat mysterious circumstances at a small farm known as The Firs, situated on the slopes of Meon Hill. The local Chief Inspector, Robert Fabian was asked to lead the investigation into Walton’s death. Very quickly the inspector came to a dead end with his investigation and failed to gather sufficient evidence to charge anyone with the murder. The case has earned considerable notoriety because some believe Walton was killed as a blood sacrifice or as part of a witchcraft ceremony or, indeed, because he was suspected of being a witch himself. However, it is known that the chief suspect was the manager of The Firs, a man named Alfred John Potter, for whom Walton was working on the day he died. It is the oldest unsolved murder on the Warwickshire Constabulary records. On 14 February 1945 Walton left his home with a pitchfork and a slash hook – a double-edged pruning implement with a sharpened straight edge on one side and concave cutting edge on the other. He was seen by two witnesses to have passed through the churchyard between 9 am and 9.30 am. This was the last recorded sighting of Walton alive. Charles was expected to be home by 4 pm. His wife, Edith returned home at about 6 pm and was worried to find that Charles was not there. His solitary nature and regular habits gave her no solace that he might be in the local pub or visiting a friend. Edith went to see her neighbour, an agricultural worker by the name of Harry Beasley who lived at 16 Lower Quinton. Together they made their way to The Firs to alert Alfred Potter. Potter claimed to have last seen Charles earlier in the day, slashing hedges in Hillground. The three of them set out in the direction of the spot where Charles had last been seen and eventually found his body near a hedgerow. The scene was a shocking one because the murderer had beaten Walton over the head with his own stick, had cut his neck open with the slash hook, and driven the prongs of the pitchfork either side of his neck, pinning him to the ground. The handle of the pitchfork had then been wedged under a cross member of the hedge and the slash hook had been buried in his neck. The first strange fact the investigation uncovered related to the murder of eighty-year-old Ann Tennant, a resident of Long Compton, some fifteen miles from Lower Quinton. Seventy years previously, in 1875, Ann had been killed with a pitchfork by one James Heywood, on the grounds that she was a witch who posses paranormal abilities. 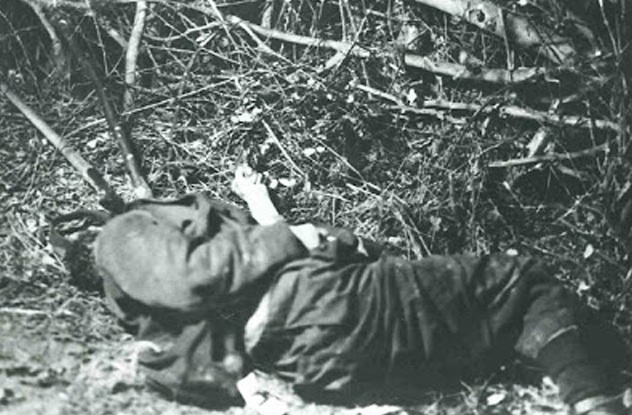 In many accounts it has been said that Ann was pinned to the ground with a pitchfork and slashed with a bill-hook. The second bizarre fact, Detective Superintendent Alex Spooner, Head of Warwickshire C.I.D., is said to have drawn the investigators attention to a 1929 book entitled Folklore, Old Customs and Superstitions in Shakespeare Land, written by the Rev. James Harvey Bloom, Rector of Whitchurch. The book included an alleged paranormal true story about how, in 1885, a young plough boy also named Charles Walton had met a phantom black dog on his way home from work on several nights in succession. On the last occasion the dog had been accompanied by a headless woman. That night Walton had heard that his sister had died. The third strange fact was another villager, Ann Tennant was murdered in exactly the same way as Charles Walton, in 1875. On 15 September 1875, at about 8 o’clock in the evening, Ann Tennant left her house in Long Compton to buy a loaf of bread. On her way back, she met some farm workers returning home from harvesting in the fields. One of the group was a local man, James Heywood, who had known Ann’s family for many years. Heywood was simple-minded and was seen as something akin to a village idiot. It is known that he had also been drinking cider. Without warning he attacked Ann Tennant with a pitchfork, pinned her to the ground, stabbing her in the legs and head. A local farmer named Taylor heard the commotion and ran to Ann’s aid. He restrained Heywood until a constable arrived. Ann was taken to her daughter’s house but died of her injuries at around 11.15 that night. Heywood claimed that Ann was a witch and that there were other witches in the village whom he intended to deal with in the same way. Although committed to trial for murder, he was found not guilty on the grounds of insanity and spent the rest of his life in Broadmoor Criminal Lunatic Asylum. He is recorded as dying there, at the age of 59, in the first half of 1890. Even today, the inhabitants of the Quintons claim that phantom black dogs roam the area and are a harbinger of death. 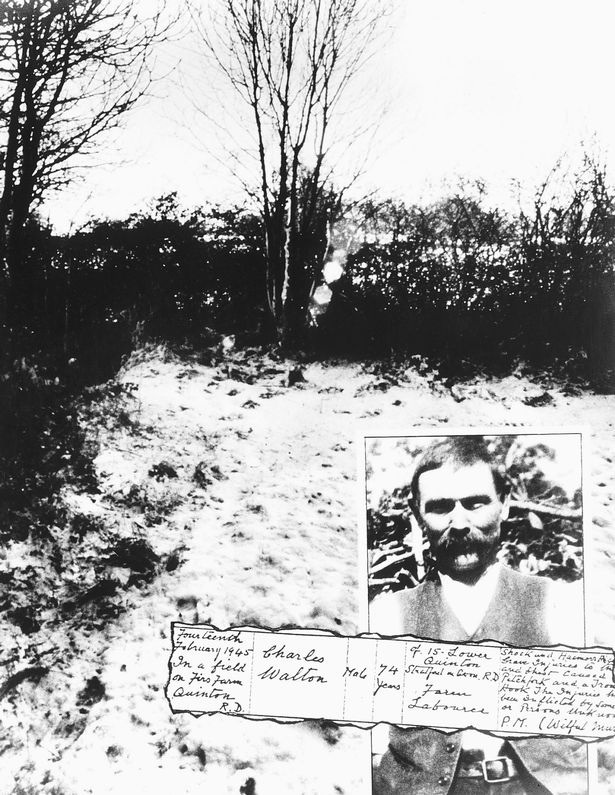 It is claimed that, soon after Walton’s murder, a black dog was found hanging from a tree close to the murder scene, while the chief police investigator himself wrote that he encountered a black dog while walking at dusk on Meon Hill. The dog ran past him and shortly afterwards he met a local boy walking in the same direction. He asked the boy if he was looking for his dog, but when Fabian mentioned the animal’s colour, the boy turned a deathly pale and fled in the opposite direction.